It also supports channel muting, WAV and VGM logging, and a tracker-style pattern visualization (which looks really neat). Please see the readme included for instructions on how to use. Second "alpha" release of version 1.1 (maybe it should be a Beta release but who cares). Enjoy! Get it here and/or watch the preview video, with audio lag courtesy of OBS. 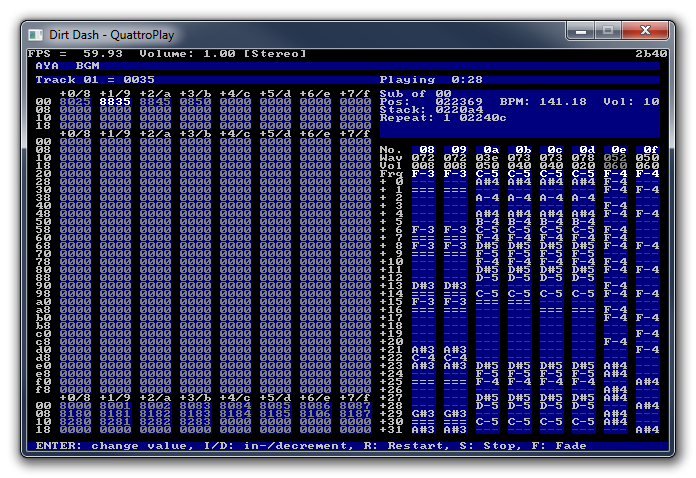 Also don't be alarmed by the lack of quattroplay.ini, it can now auto generate this file. Released version 2.0 (after a very long alpha period). This will be the last release for a while. Also, here's a rip of Battletoads Arcade, converted to work with QuattroPlay. Playing it is easy with the new version. Just extract the files somewhere, run QP and drag and drop the INI file to play. I have released assembler macros and tools that you can use to make your own music for the Quattro sound driver. Also included are some of the songs I made a while ago. It might provide an insight into how Namco made their music back in the days.